A lady can never have to many pair of delightful diamonds hoop earrings! 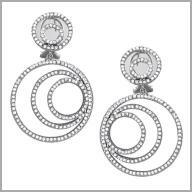 Crafted in polished 14K white gold, these earrings feature three large circles, of different sizes. Each earring features a total of 172 round cut diamonds in prong settings. The total diamond weight is approximately is 3.510 ct of H in color and SI in clarity.